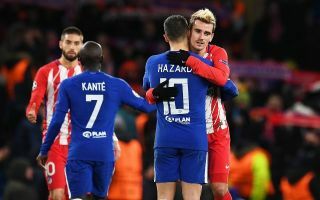 Manchester United are reportedly keeping an eye on the transfer situation of Atletico Madrid forward Antoine Griezmann. The France international has been linked with the Red Devils in the past, as well as numerous other top clubs before signing a new del at his current side in the summer. Griezmann has shown himself to be one of the finest attacking players on the planet when he’s on form, and would undoubtedly be a good fit at Old Trafford. Jose Mourinho could do with more options up front after the struggles of Alexis Sanchez to fit in since signing from Arsenal back in January. According to Don Balon, the Red Devils remain interested in Griezmann, though it may be that Manchester City are leading the running for the 27-year-old’s signature. Antoine Griezmann to Manchester United transfer saga to do the rounds again? The report states City would be willing to fork out the £180million required to sign the World Cup winner, triggering his release clause. That seems about the going rate for top players these days, and he’d unquestionably be another great signing for this City squad as well. Pep Guardiola already has big names to choose from up front, but Sergio Aguero isn’t getting any younger and Leroy Sane has been less involved so far this season after a dip in form.